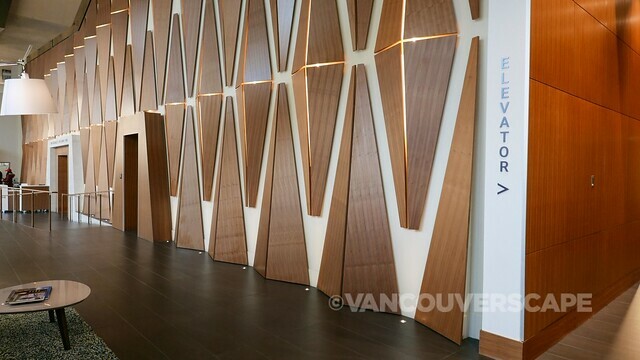 High ceilings, light wood, a beautiful hanging sculpture — our first impressions upon walking through the front doors and into the lobby of the Civic Hotel Autograph Collection®, Surrey’s newest hotel offering. 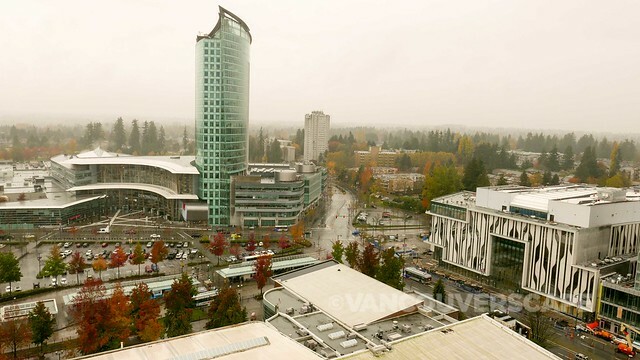 Open for just over a half year, the sleek property forms part of a new Surrey City Centre. 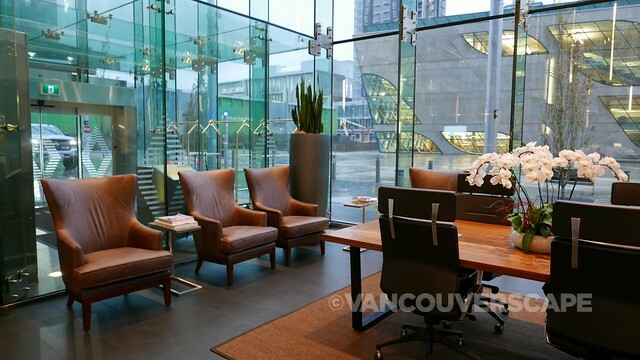 Over 20 years have passed since a hotel of this caliber has opened in the area, and with business travellers in mind, the boutique hotel is steps from both Surrey Centre Library and City Hall, serving as a central hub for all things downtown. The Civic is a tall, slender beacon, easy to spot as you head into Surrey. 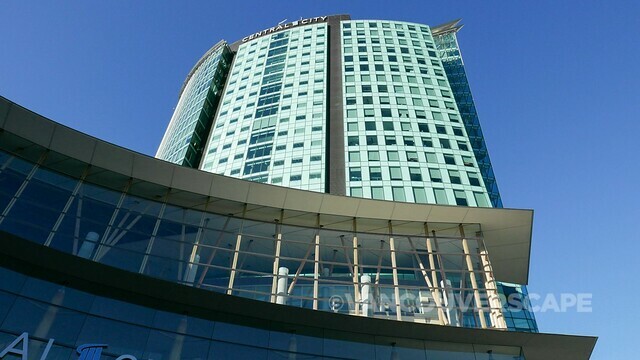 In fact, 3 Civic Plaza (housing both hotel and residences) is the third tallest building in BC and the tallest tower South of the Fraser River. At 265m (540 feet), we’re looking forward to the hotel’s soon-to-open rooftop deck and patio that will surely offer amazing panoramic views of the city and coastal mountains. All 144 rooms (on 16 floors) feature clean, white walls, designer mirrors and a green-minded bathroom vanity mirror that dims by touch. Another major sustainability initiative is the hotel’s energy-efficient heating and ventilation system. 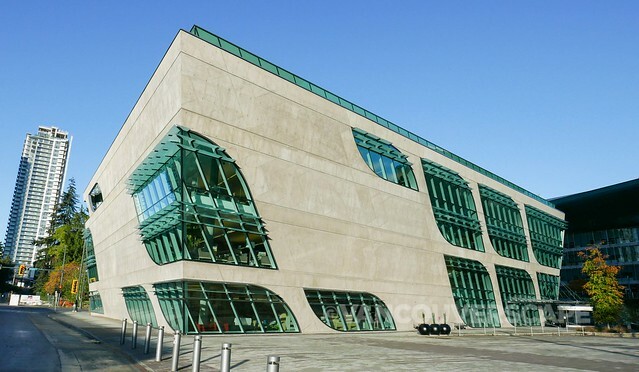 Within the building’s concrete slab is a system so intelligent that any excess heat gets returned to the slab for storage (or alternatively offloaded in a municipal geothermal field beneath Civic Plaza). Guest rooms characterized by warm earth tones and themes that represent the culture and natural beauty of our province. Each floor embodies a region of BC. 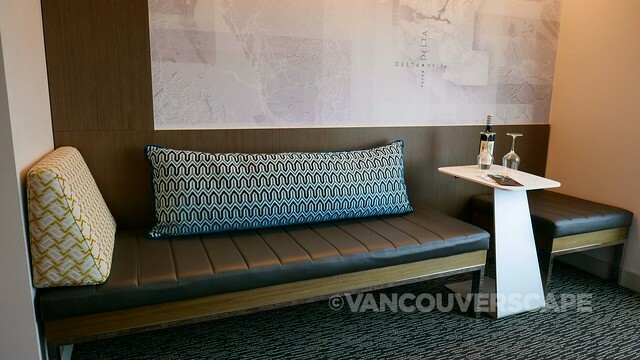 As we’re on the 21st floor (Metro Vancouver), our Delta room contains a topographical map illustration of its namesake. 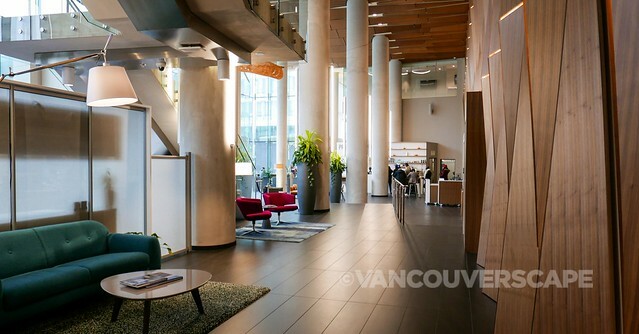 Civic Hotel’s eye-catching design is due to local BC firm ZGF Architects, Inc., who have taken the city’s diverse cultural influences to mind as they created a space to celebrate British Columbia. A tailored, permanent art collection showcasing BC artists completes the picture. 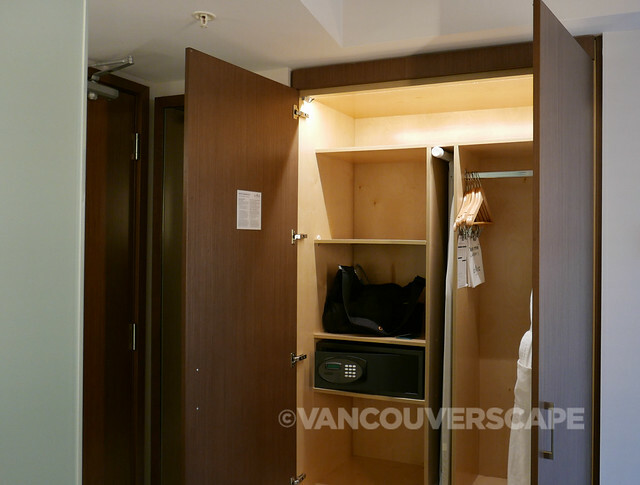 Just past the entrance is a floor-to-ceiling closet with full-length mirror. 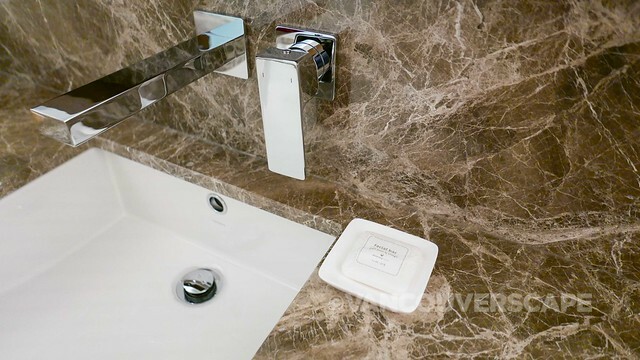 The bathroom area contains a long marbled counter with a sink and storage areas to the left and right (with ice bucket, water bottles to one side, and an Illy coffee-making station at the other). Behind the sink area is a shower and a separate toilet. 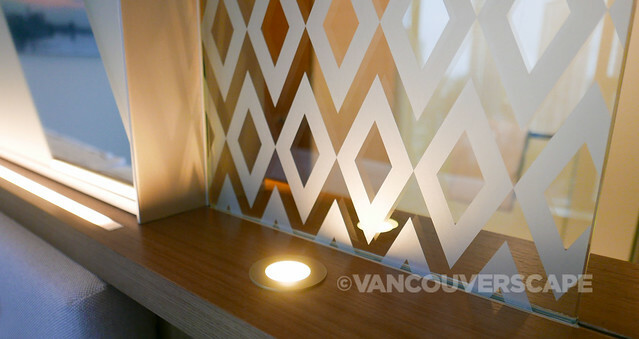 A patterned glass wall divides this space and the bedroom. Along the wall is an upholstered bench with work table and cozy pillows, perfect for unwinding and gazing out the full-length windows to the city below. For a room of this size, there’s a lot of storage space as well as enough plugs for connecting your mobile devices. On the wall-mounted flatscreen Samsung TV you’ll find a selection of local, international and speciality channels, with a focus on independent films. Autograph Collection Hotels have formed a partnership with Indie Film Project, a curated collection of Indie films, celebrating independent storytelling. Just scroll down the page to locate a selection of film fest faves and notable offerings for cinephiles. The high-quality mattress and linens are super comfy and inviting for a sound sleep. 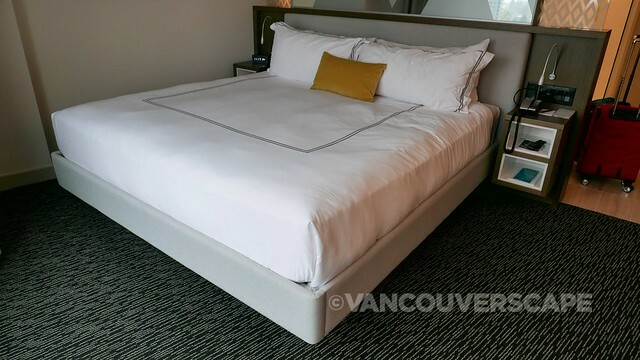 The bed is positioned to take full advantage of the view out those windows too. We did find that while the drapes cover the window, they’re missing a valance, creating a row of light that could easily be avoided with the addition of that upper element. Friendly staff greeted us upon check-in, giving us tips on what to see and do in the area. We may be locals, but haven’t spent much time in Surrey. We soon find out there’s a lot of great cafés, a library, shops and businesses within walking distance of the hotel. An outdoor 25-meter laptop pool and jacuzzi are available for guests (in season), with a 24-hour fitness center, changing rooms and showers open year-round, all on the fourth floor. 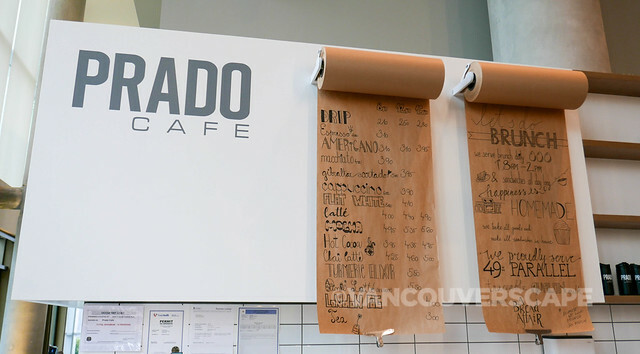 Grab a healthy breakfast or lunch at Prado Cafe, located inside the lobby behind the reception desk. Local roasters Parallel 49 are showcased here, easy to spot by their turquoise cups and saucers at the counter. 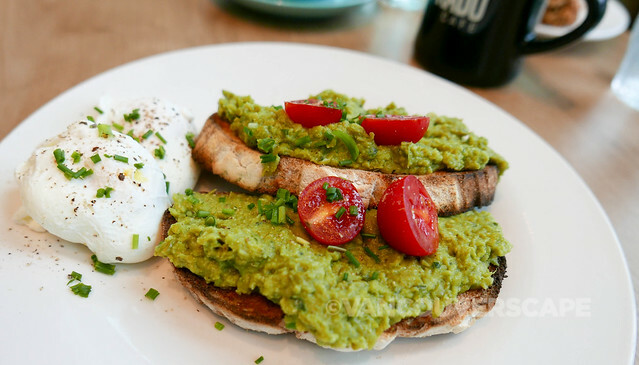 The avocado, pea and mint smash on sourdough is a fine choice for a light lunch, made even better with a side of free-range poached eggs. Save room for a gourmet muffin or cookie. We noticed a mix of students, locals and guests reading and relaxing at the tables and high-top counters looking out onto the square. An outdoor patio with bright green chairs are ready and waiting for sunnier days. 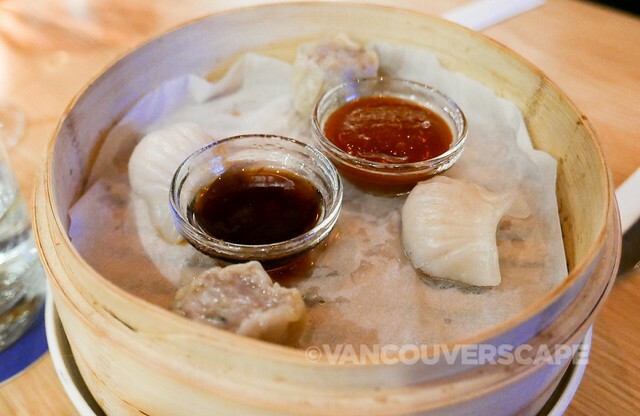 Also on the lobby level, the Dominion Bar + Kitchen is the hotel’s signature restaurant, serving up New Canadian-inspired dishes, a full mashup of global influences, ranging from potstickers to grilled chicken coconut curry. 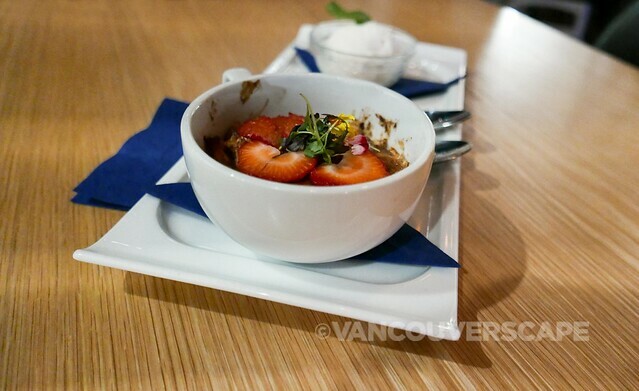 The menu is divided into finger food, forks (small plates), casuals, entrees, pizzas and desserts. If it’s a burger you’re after, there’s two: the Confederation and the Dominion. 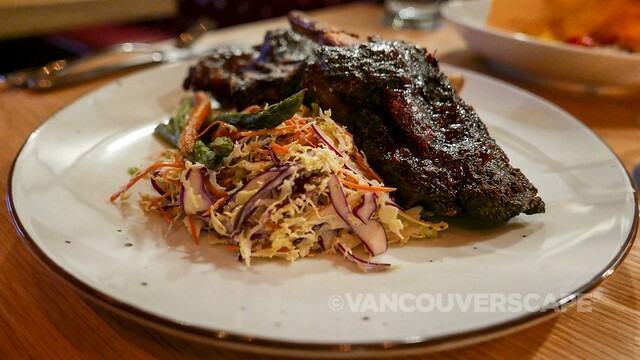 We ordered the Korean beef ribs, slow-cooked in a sticky-sweet Southern-meets-Gochujuang chili barbeque sauce. It’s rich and incredibly addictive (we’ve heard it’s a popular choice). 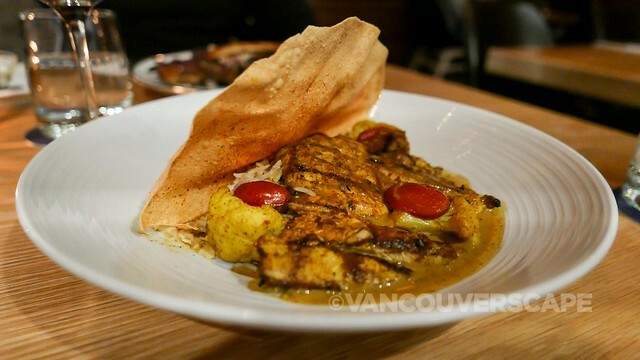 Another dish we tried is the grilled chicken coconut curry (also available in a vegetarian version using grilled paneer). This hearty dish includes a papadum, coconut rice, seasoned cauliflower, hummus and nuts — a little bit of everything, ideally paired with a glass of red (my choice: Pascual Toso Estate 2016 Malbec). 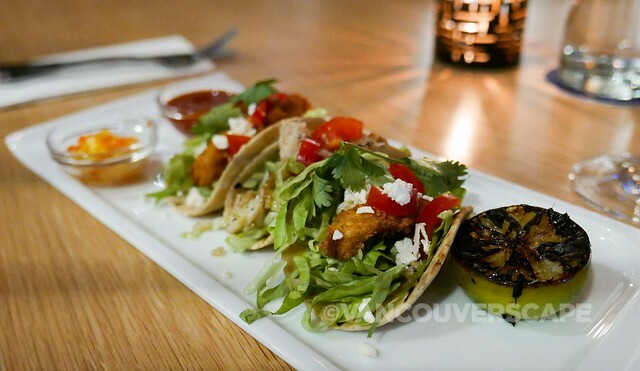 We also recommend the trio of tacos: Ling cod, crispy sliced chicken, veggie pakora (you can order any combination of the three, or get six and make it an entree). As for drinks, there’s something for every taste, from inspired cocktails to craft beer, mocktails, classics, wines and bubbly by the glass and bottle, even a handful of global reserve wines. Indulge in a slushy drink such as the Mango Bellini on a sunny day. 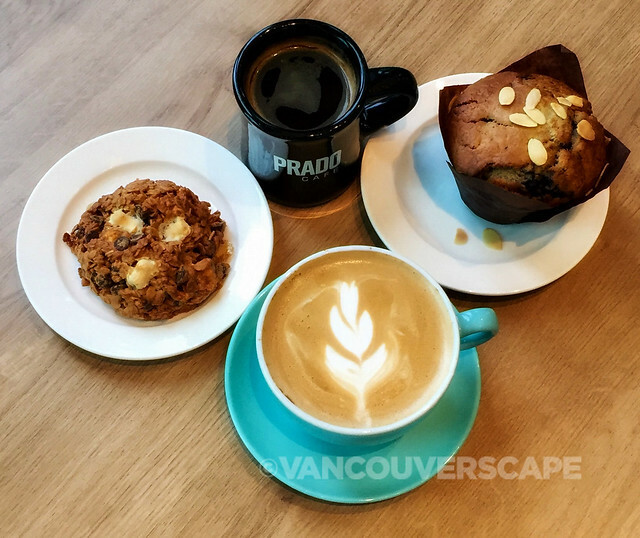 We saved just enough room for the warm apple streusel, a beautifully presented dish containing vanilla-infused braised Fraser Valley Gala apple, rolled oats crumble with French vanilla gelato to melt over it all. The music varies by the decade (and hour); on weekends, a DJ kicks up the action a notch starting at 9 pm. Civic Hotel guests are served a buffet style breakfast here as well, between 6:30 am and 10 am, seven days a week. Following buffet hours, the Dominion menu moves to brunch service on weekends. 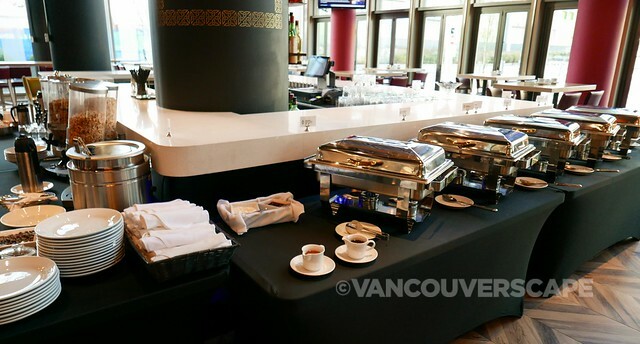 The Dominion also offers high-end banquet services as well as in-room dining. 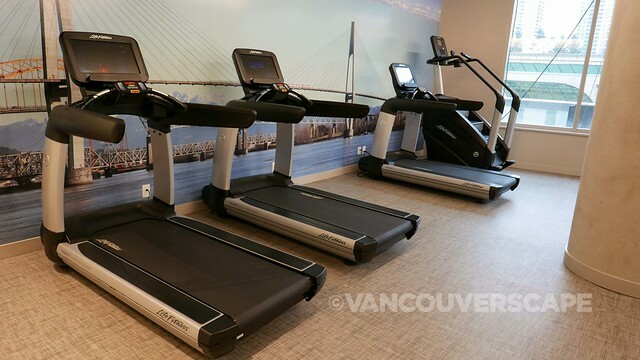 The Civic is super close to Skytrain, shopping, Central City Brewing, and just over a half hour from both Vancouver and Abbotsford International Airports. In fact, we took a rainy weekend afternoon to enjoy a tour of Central City Brewing and sample some local craft beers. 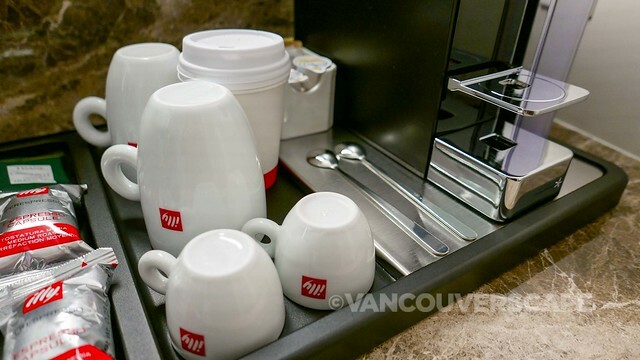 Civic Hotel Autograph Collection® is located at 13475 Central Avenue in Surrey. 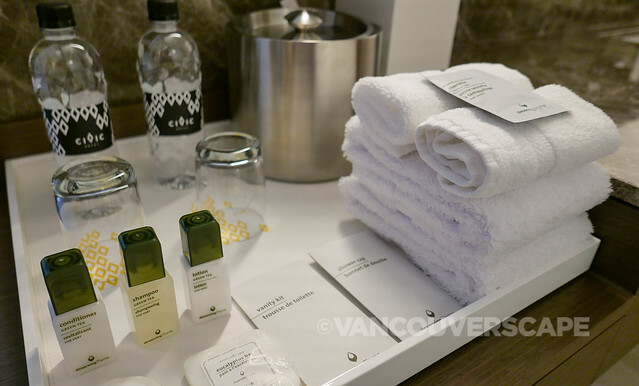 Our stay was compliments of Civic Hotel, An Autograph Collection®. Opinions, as always, are our own. 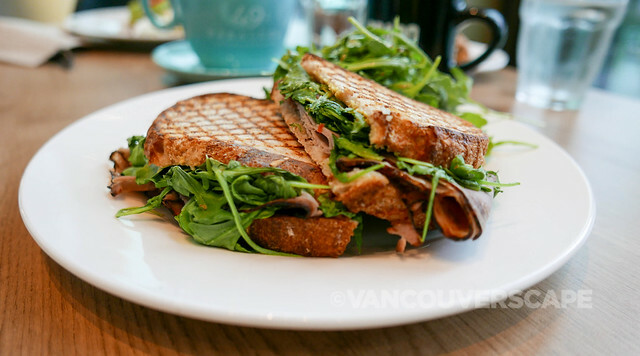 Non-watermarked images courtesy of Civic Hotel.